12, ALLIGATOR Get paid to type! SBSA is a financial transcription company offering part-time positions. Create your own schedule Competitive Production-Based Pay Close to campus! Must be able to touch-type 65wpm Apply Online: www.sbsgrp.com 10-22-1310-14 FT LEASING AGENTExperienced, Friendly, Energetic person. Hourly & bonus. Great benefit pkg. Must be available weekends. Apply in person Hunters Crossing Apts. 4830 NW 43rd St. Alachua, FL DFWP 12-4-13-50-14 DOMINO"S HIRING Delivery Experts & Assistant Managers & Future Managers. Drivers earn between $14-$17 per hour. GMs earn 40K-50K+. Apply at gatordominos.com 12-4-1337-14 Opus Coffee We are searching for fun and active students to work 15 to 30 hours per week at a fastpaced coffee bar. Starting pay is $8/hour + tips. Applications downloaded at opuscoffee.com; click on the Employment link at the bottom and follow the instructions. 10-25-13-9-14 University of Florida Smoking Lab needs you to participate in study on effects of different activities on craving, withdrawal, and smoking. Some compensation provided. Call Allison at 336-406-3706 or email uflsmokelab@gmail.com 10-31-13-14 Exp. PRESSURE WASHING person w/ truck to pull trailer, pc, internet, cell; flexible hrs, full time,good pay. Only serious/dependable candidates, please! 352-870-6017 | www.mandrells.com/apply 10-31-13-12-14 Computer research needed. Must be computer savvy. Work schedule flexible, pay based on performance. Bilingual is a plus. Email resume to jholifield1@gmail.com 1121-13-25-14 (PT) Janitorial/Handyman needed for a community clubhouse. Knowledge and experi ence in all aspects of property maintenance is helpful. Flexible work hours available. Candidates must have reliable transportation. Competitive pay DFWP, EOE. Fax resume to: 352-378-7001 or email resumes to hr@emmergroup.com Attn: Janitorial/ Handyman Position. Visit our website at www.emmergroup.com to download our application. 10-23-13-5-14 Do you have a business that provides a service? 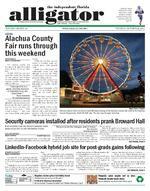 Place your ad in the Services Section of the Alligator Classifieds for as little as $2.50 per day. Call us at 373-FIND. IMPORT AUTO REPAIR. BMW, Mercedes, Porsche, Volvo, VW, Honda, Toyota, Nissan, Mazda. Quality craftsmanship, reasonable prices, near UF, AAA approved 378-7830 www.carrsmith.com 12-4-71-15 Want to be a CNA, phlebotomist or pharm tech? Express Training offers courses, days, eve, weekend. All classes live, no videos. Call 352-338-1193 or expresstrainingservices.com 12-4-13-71-15 PERSONAL TRAINING 300 Personal and Group Training Flexible Scheduling Exclusive Facility Call for a free workout 339-2199 12-4-71-15 NEED A LAWYER?SiddiquiLegal.com Private Experienced Affordable 12-4-71-15 HORSE BOARDING & GOATS FOR SALECharlie 352-514-9858 12-4-71-15 AUTO TITLE LOAN Need Some Fast Cash??? Keep Your Car! No Key Required! No Credit Check! No Payment for 30 Days! Ask about our Free Loan & Free Gas Specials! 352-692-CA$H (2274) 11-27-13-60-15Spanish Tutor$10/Hour www.languageconvo.com 10-22-5-15 HIV ANTIBODY TESTINGAlachua County Health Dept. Call 334-7960 for appt (optional $20 fee) THE TRUE YOU! Lose 8-15 pounds in 4 weeks Only $119! Gain muscle while you lose fat Groups forming now. 339-2199 12-4-71-16 HIV ANTIBODY TESTINGAlachua County Health Dept. Call 334-7960 for appt (optional $20 fee)Family Chiropractic Since 1977. Two blocks from U.F. 373-7070 12-4-71-18 Want to make a connection?Place your ad here to look for someone to share a common interest with or for your true love can place a FREE FOUND AD in our lost & found section. Be kind to someone whos lost what youve found. Call 373-FIND. IS YOUR BUSINESS, CLUB OR ORGANIZATION HAVING AN EVENT? DO YOU HAVE A SPECIAL ANNOUNCEMENT? PLACE YOUR AD HERE AND GET IT NOTICED! "World 1-1" is the first in a documentary series on the history of video games. This chapter is about Atari and how they created a new industry. It focuses on the business deals, the personalities of the pioneers, and the creations of the engineers. This documentary will be a combination of interviews, archival footage, and reflection that retells the story to a new generation that may not know the roots of their favorite hobby. Find us on kickstarter.com to help donate from $1 to over $5000 or to help spread the word! 10-29-13-7-20 Get the party started! Place your Entertainment classified today to get people up and about. Call 373-FIND. Rocky Creek Paintball In Gainesville It's a Blast!Call 371-2092 12-4-13-71-21SAY:"I FOUND IT IN THE ALLIGATOR! "Trying to get to and from somewhere? Want to cut back on that gas bill? Place an ad or show off your bus and shuttle service. 373-FIND Furry, feathery, scaly...no, not your roommate...pets. Find or advertise your pets or pet products here in the Pets section of the Alligator.Now you can easily submit your classified adfor print and/or web editionsright thru our website!Just go to www.alligator.org/classifiedsVisa and Mastercard accepted. Finders Keepers? If you find something, you can place a FREE FOUND AD in our lost & found section. Be kind to someone whos lost what youve found. Call 373-FIND.